The challenge set at the end of the previous instalment was to continue improving the recipe you’ve been working on for the past few challenges. In the case of my recipe, the biggest outstanding problem was the header. It worked fine on large screens, but not on small ones. The sticky top was only really there to illustrate how those work, so I started by removing it and removing the top margin needed to make it work as a sticky top. That left a regular but very large display heading. The large heading is perfect on large screens, but terrible on small ones. Ideally I would have liked to have the heading change size depending on the breakpoint. Unfortunately that’s not possible without extending Bootstrap with a custom theme, and we can’t do that without learning a whole new language, SASS. We will get there, but not just yet! The first of the two headers defaults to full width and displayed, but hides at the largest breakpoint. The second header is hidden by default and only three quarters wide, but shows at the largest breakpoint. The lead paragraph has an automatic width. Together what this means is that for all breakpoints below extra large the first heading is visible and takes up the full width of the page with the lead paragraph wrapped to the next line. At the extra large breakpoint that first header is hidden and the second bigger but narrower one appears, and the lead paragraph now has room not to wrap, so it doesn’t, and settles next to the big header. Note: the above example was correct as of 12 August 2018, to get the most recent versions copy and paste the code from the Bootstrap docs. Where should you include the above code in your file? That depends! Which of those two is least-bad? That depends! A web app that’s visible but doesn’t work is probably more of a frustration than a help, but a blog post that you can start to read before the fancy features becomes active is probably much less frustrating. Most of the web is for reading, so the advice in the Bootstrap docs is to include the above three imports as the last three lines of the <body> section of your page. An alert is a chunk of clearly delineated text designed to catch the user’s eye and deliver them a short message. Alerts might be dismissible. You’ve probably seen them all over the web. 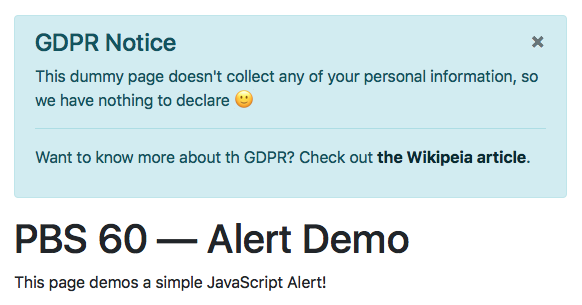 A very common example these days is cookie and other GDPR notices. Another example would be in web apps like web mail clients. You might compose an email and hit send, your inbox would then re-load, but with an alert at the top of the screen to tell you your message was sent. To help screen readers and other assistive technologies interpret your alert you should give it the ARIA role alert using the role attribute. We now have a dismissible alert! You can find the full code for a sample page containing this dismissible alert in the ZIP as pbs60a.html. In this case that means we’ll be working with a jQuery plugin named .alert(). Adding new Bootstrap components to a page dynamically and initialising them. Responding to user interactions with a Bootstrap component. Interacting with a Bootstrap component programatically. Our example page has two buttons, one to add dismissible alerts to the page, and one to dismiss all alerts at once. Note that we’ve not looked at Bootstrap forms yet, so these buttons are a little sneak-peak at what’s to come later. 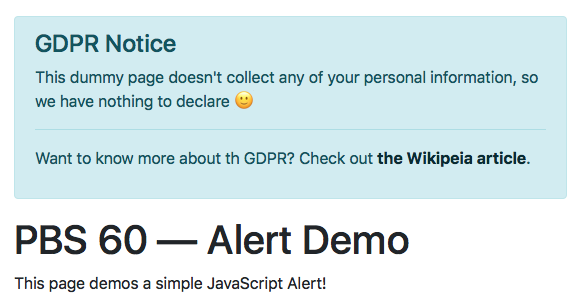 What the .alert() plugin does when called with no arguments is search the HTML element it’s called on for buttons with an HTML data attribute named data-dismiss with the value alert, and if it finds any, it adds the appropriate event handler to make the button dismiss the alert. When Bootstrap components allow users to interact with them they generally provide matching event handers. While it looks a little odd at first, the events are generally named EVENT.bs.PLUGIN (bs for Bootstrap). In the case of dismissible alerts, the obvious event to listen for is the alert being dismissed, and Bootstrap provides just such an event, which it has named close.bs.alert (notice how it follows the naming convention, close is the event, followed by .bs. followed by the plugin name, alert). Bootstrap’s jQuery plugins will generally provide functionality to programatically do what ever a human can do with the relevant component. In the case of dismissible alerts that means dismissing the alert. The way Bootstrap plugins work is that when you invoke them on an HTML element with no arguments they initialise that element with the given plugin, then, you can interact with the newly initialised elements by calling the plugin on them again, but with the thing you want to do passed as the first argument. So, if we had a reference to an initialised alert stored in a variable named $a we could close it with $a.alert("close");. Again, you’ll find all the code for this example in pbs60b.html in the ZIP. Add a dismissible alert into the recipe you’ve been working on for the last few instalments. Add a text box into which the user can type some text, and a dropdown list with an entry for each of the Bootstrap alert styles (alert-primary, alert-secondary …). Add a button that will create a new dismissible alert with the text from the textbox and the style selected in the dropdown. Add a button to delete all the alerts. I suggest reading the Bootstrap documentation for the alert component. Hopefully you can now see how the descriptions on that page map to the reality in the browser, and, to the code in the worked example.